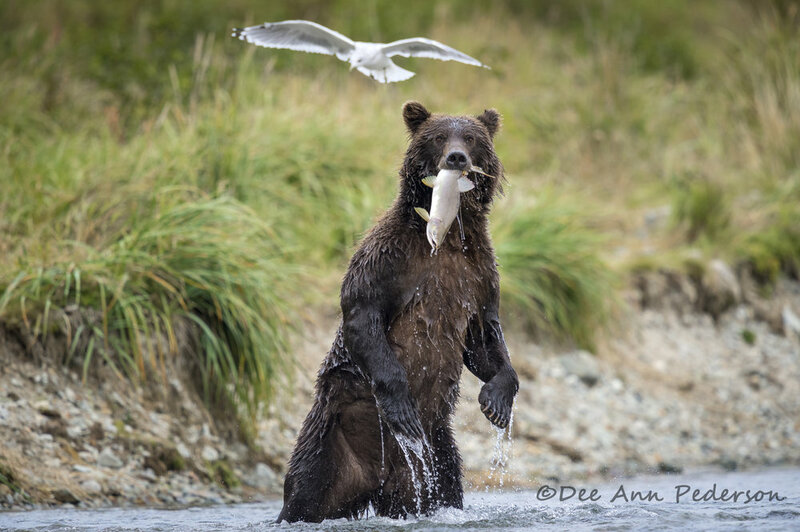 Dee Ann says: Of all my destinations across the world, I have a special love for the Alaska Peninsula, and for the coastal brown bears who make this place home. Over the course of 15 consecutive years photographing here, I have developed an in-depth knowledge of and reverence for the personalities and life cycles of these bears, as well as for their reciprocal connection with the land. It’s in rhythms and cycles that life finds sustainable balance. Nature’s patterns weave a tapestry, a fabric of oneness, each part as full of majesty and awe as any other, each piece integral to the whole. Although I may single out bears in many of my images, I have come to respect and honor life’s unity here, and to observe how the bears play out their part in the overall cycle of life on the Peninsula. To know the eyes, the ears, the nose, the color, the personality… those unique attributes of each bear… helps to identify individuals as well as to appreciate their patterns and behaviors. By sitting quietly for hours at a time in this beautiful place, I’ve become a first-hand observer of nature’s way. After time, I’ve come to recognize the uniqueness of each bear; that’s probably why many of them now have names. For those like me, who find unique connection with natural beauty, nature draws us to return over and over again. It’s something about the energy of a place, energy that can only be felt, but not put into words. We come back to observe the patterns, to see what’s the same and what’s different, to see which females come out of the den with spring cubs, to see how the harsh winter has pounded the coastline into new shapes. I find seasonal nuances and patterns intriguing; knowing generations of bears, to watch cubs grow into adults and have cubs of their own, touches me. Something about this place matters deeply to me; perhaps I’ve become part of its rhythm, too.